Girl In A Coma: Rockers Tackle Their Second Language The Texas trio performs loud Latin alt-rock in both English and Spanish — though its members are only fluent in one of the two. Girl in a Coma performs in both English and Spanish — though none of the members is fluent in the latter. Listen to two of Girl in a Coma's Spanish-language songs. 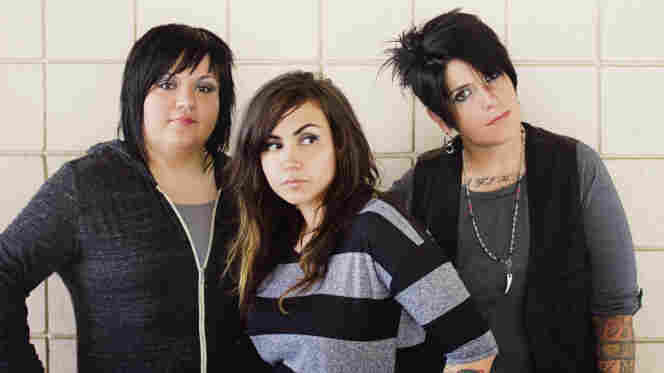 Girl in a Coma is a trio of young women from San Antonio who play rock music — loud rock music — in both English and Spanish. Lead singer and songwriter Nina Diaz, 23, is the youngest member of the band. Her sister Phannie plays drums, while their longtime friend Jenn Alva slaps the bass. Girl in a Coma is signed to Blackheart Records — a label owned by rocker Joan Jett — and takes its name from the song "Girlfriend in a Coma" by The Smiths. While the members take pride in their Latino heritage, there is another thing they have in common: None of them is actually fluent in Spanish. They aren't alone: According to a national survey by the Pew Hispanic Center in Washington, D.C., 23 percent of adult Latinos in the U.S. are English-dominant. Nina Diaz says that growing up, she often felt left out in her family. "When the grandparents were talking to my older sister, or even adult conversations, you could hear them talking and it felt like a foreign thing," Diaz says. "It's like, 'What are you saying? I want to understand you.' But then I would go off and play with my toys, and was like, 'Whatever, I guess I'll understand it later.' "
Diaz says she grew up very much like the slain Tejano singer Selena: an English speaker who listened to English-language radio and didn't pay attention in Spanish classes at school. She says she often regrets not taking the time to learn her elders' language when she was younger. "Now I realize I kind of messed up," she says. "There are times, especially when I'm singing [a song] in Spanish, that I'm basically teaching myself how to speak Spanish by singing it." Diaz says that when she writes a song in Spanish, she studies the lyrics exhaustively, singing them to herself as many times as possible before performing the song live. But even outside of the music, communicating without Spanish can be difficult. "It's hard enough as it is, being an all-girl band, two-thirds gay, all Latinas," Diaz says. "Whenever they ask us a question in Spanish, all of us are like, 'Can you repeat it again in English?' I admit that it's a little embarrassing. I want to be able to stand up and say, 'I am Latina and I know what you're saying and I'm going to answer you back.' "